Each CCCU institution is committed to integrating the Holy Scriptures—divinely inspired, true, and authoritative—throughout all aspects of the institution, including teaching and research. Our professors pursue academic excellence because they are committed to God as the author of truth, and they know that truth has implications for every academic discipline. Each CCCU institution is committed to fostering Christian virtues rooted in the Scriptures and nurtured through the institution’s curricular and co-curricular programs. Our purpose is to form students of moral commitment who live out Christian virtues such as love, courage, and humility in every aspect of their lives. Each CCCU institution is actively committed to advancing God’s redemptive purposes in the world by graduating students who live and share the Gospel in word and deed. Our graduates are hopeful realists who recognize the brokenness of the world but believe that God has called them to work for its healing – as doctors, teachers, marketers, engineers, parents, soccer coaches, and in a host of other ways. Participation in a network of like-minded, mission-driven, academically excellent Christian colleges and universities around the world. Access to CCCU-sponsored professional development conferences for a wide variety of peer groups as well as specialized development institutes for new faculty members, emerging campus leaders, and new campus presidents. Participation in a national association of institutions with similar missions advocating for rights, recognition, and funding in the federal legislative arena. Admission of qualified students who apply to any of the CCCU’s faith-integrated, off-campus study programs in nine locations across the U.S. and around the world on a space-available basis: American Studies Program in Washington, DC; Australia Studies Centre in Brisbane, Australia; Contemporary Music Center in Nashville, Tennessee; Latin American Studies Program in San José, Costa Rica; Los Angeles Film Studies Center in Los Angeles, California; Middle East Studies Program in Amman, Jordan; Northern Ireland Semester in Belfast, Northern Ireland; Scholars’ Semester in Oxford and Oxford Summer Programme in Oxford, England; Uganda Studies Program in Kampala, Uganda. Receipt of legislative and legal updates and action alerts. Copies of the CCCU’s biannual flagship magazine, Advance, which includes features, research and analysis, essays, and book reviews, all of which promote the work of Christian higher education, as well as educate and equip campus leaders in their work. Participation by faculty, administrators, and staff in online community groups with their peers from other CCCU campuses in order to exchange questions, ideas and advice, as well as receive electronic communications and newsletters from the CCCU. Ability to post job openings to the online CCCU Career Center. Listing on the CCCU’s website, www.cccu.org, with a link to the institution’s website. CCCU institutions that are accredited through one of the U.S. regional accrediting organizations are eligible to participate in an innovative consortium that enables institutions to share online courses to increase revenue, retention, and completion. Our CCCU institutions fit into one of four categories: Governing Members (which are voting members as it relates to selecting members of the Board of Directors), Associate Members, Collaborative Partners, and International Affiliates. These different categories are intended to acknowledge the variety of missions and different contexts in which CCCU institutions operate and thus to allow each institution to find its best fit within the CCCU. This collective effort is invaluable not only to strengthen the voice of Christian colleges and universities in the landscape of higher education but also to advocate for the collective good that religious colleges and universities bring. Biblical Truth: A demonstrated commitment to integrating the Holy Scriptures—divinely inspired, true, and authoritative—throughout the institution, including teaching and researching in all academic disciplines. Christian Formation: A demonstrated commitment to fostering Christian virtues grounded in the Scriptures and nurtured through the institution’s curricular and co-curricular programs. Gospel Witness: A demonstrated commitment to advance God’s redemptive purposes in the world by graduating students who live and share the Gospel in word and deed. CCCU institutions offer comprehensive undergraduate curricula rooted in the arts and sciences and may also offer graduate programs and degrees. All U.S. institutions must be in good standing with a regional accrediting body. International schools must be recognized by the equivalent accreditation body in their respective countries. All CCCU schools support other Christian colleges and universities and advance the cause of Christian higher education through participation in the programs of the CCCU and payment of the annual dues. CCCU campuses are urged to demonstrate continuing support for the CCCU through annual registration for CCCU professional development and/or student programs. In addition, CCCU institutions recognize that fellow schools are seeking to pursue faithfully their institutional missions in their particular context, and therefore they demonstrate respect and support for each other. All CCCU institutions demonstrate responsible financial operations, have institutional practices that reflect high ethical standards, and operate all financial and fundraising activities consistent with the standards of the Evangelical Council for Financial Accountability. 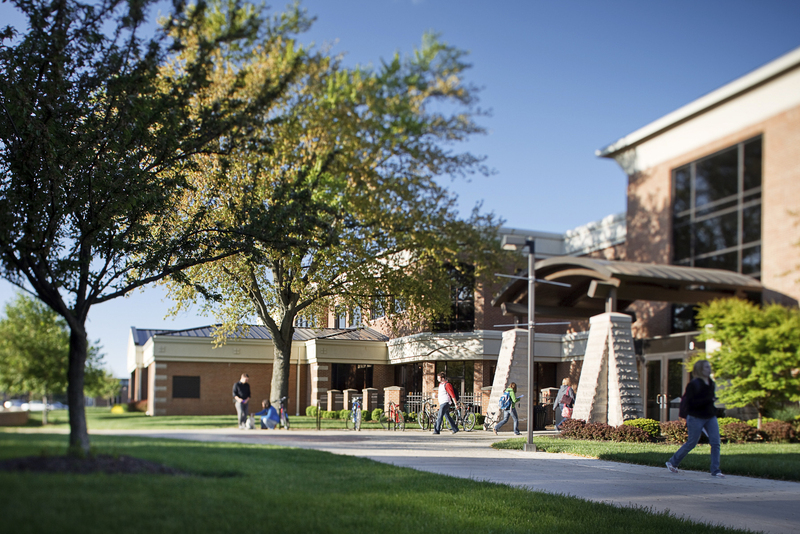 CCCU governing and associate members have a continuing institutional policy and practice, effective throughout membership, to hire as full-time faculty members and administrators only persons who profess faith in Jesus Christ. We hold the Christian belief that the Earth and the entire universe are God’s good creation. We advocate for the sustainability and preservation of the Earth. We hold the Christian belief that human beings, male and female, are created in the image of God to flourish in community, and, as to intimate sexual relations, they are intended for persons in a marriage between one man and one woman. We advocate for the right of Christian institutions to maintain practices that align with this sexual ethic. We hold the Christian belief that all human beings, without exception, are invested with inherent worth and dignity. We advocate for the wellbeing of the underserved and marginalized, for the protection of people of all faiths from religious persecution, and for the preservation and advancement of religious freedoms. We hold the Christian belief that the Gospel calls us toward reconciliation with one another. We advocate for humble and courageous action that honors the unity of the human race, values ethnic and cultural diversity, and addresses the injustices of racism. CCCU governing and associate members voluntarily agree to align as institutions with these advocacy positions. In addition, the Council’s own services, advocacy, employment practices, and student programs will be consistent with these alignments and Christian beliefs and principles.